It’s the most wonderful time of the year! Oh how I love thee, Fall. 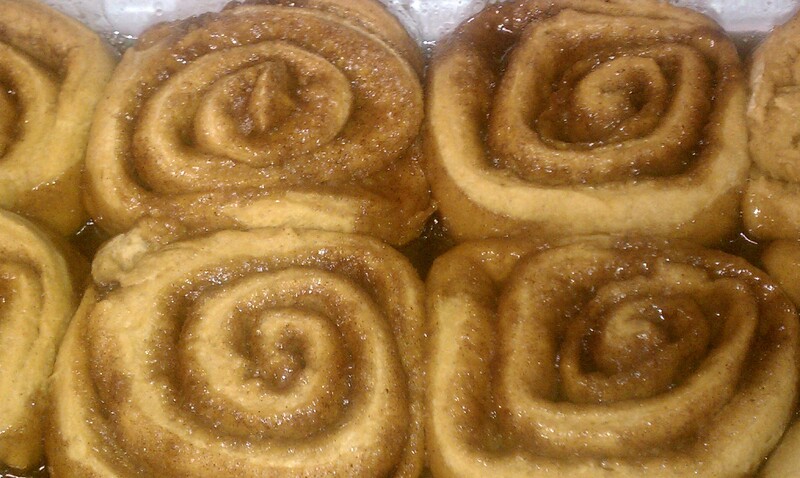 If you remember my Top 5 post, you’ll know that cinnamon rolls are a real favorite of mine. There’s just nothing better. In fact, the only way to improve a traditional roll is to add a punch of pumpkin. This recipe is from one of my favorite blogs called Good Life Eats. It’s a bit involved, and you have to work with yeast, but the results are just scrumptious! First, stir your yeast into warm water in a large bowl. Let it sit for 5 mins before stirring to combine. 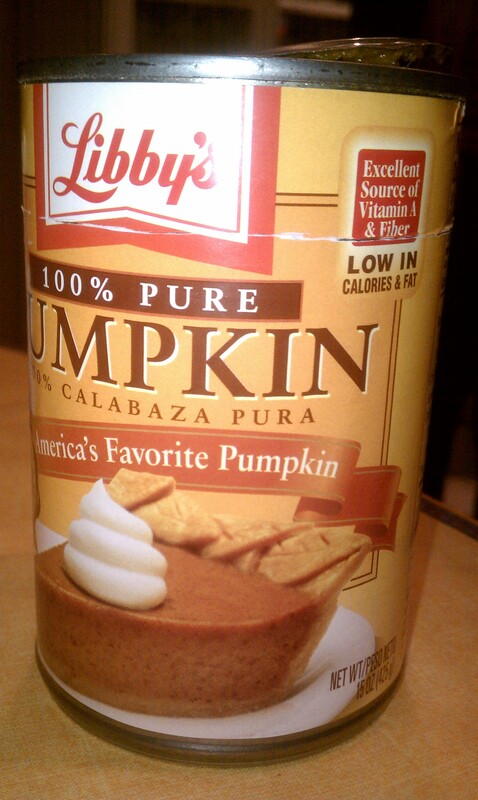 Add the milk, eggs, pumpkin, butter, 1 1/4 cups flour, brown sugar, salt, cinnamon, and ginger to the yeast mixture. Beat vigorously for 2 mins. Slowly add in the remaining flour, a little bit at a time, until the dough is stiff enough to knead. Begin with 1 1/2 cups of flour and increase if necessary. Knead the dough on a floured surface. Add additional flour until you have a smooth, elastic dough. Put the dough in a greased bowl. Coat the entire dough ball in the bowl with oil. Cover with plastic wrap and let the dough rise until doubled, approximately 1 hr. Combine the white sugar, brown sugar, cinnamon, allspice, ginger, nutmeg and cloves in a another bowl, and set aside. 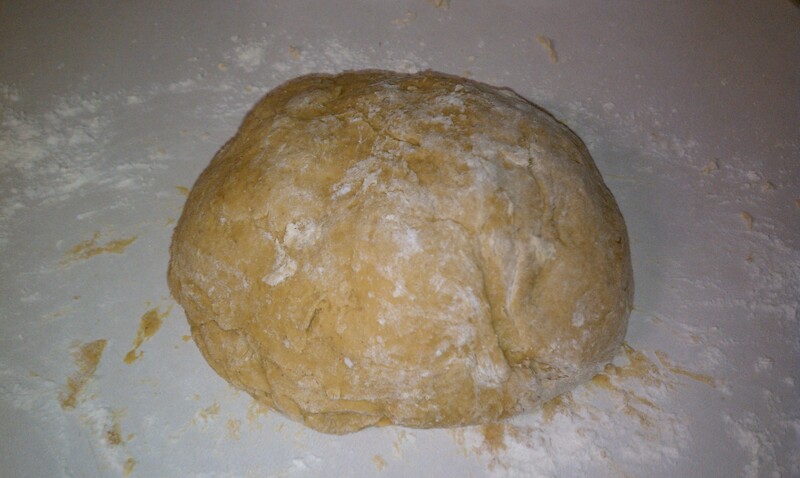 Transfer the risen dough to a lightly greased work surface, and pat or roll it into rectangle. 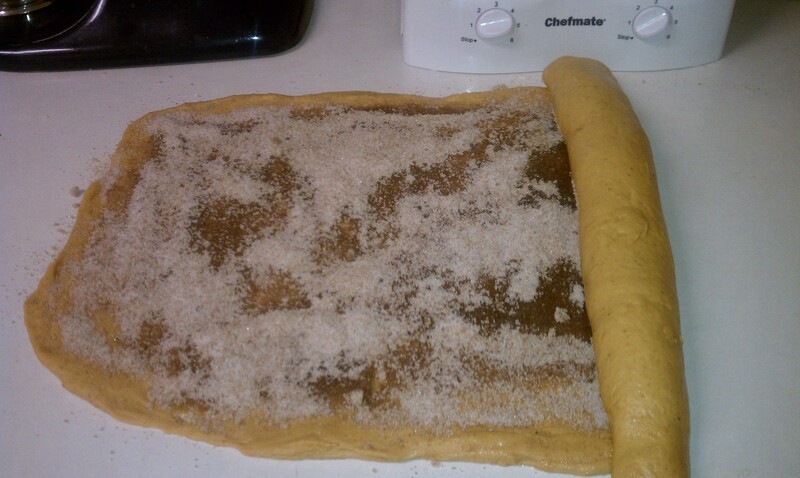 Spread softened butter over dough and then sprinkle with the sugar mixture. Roll the dough into a log the long way; it’ll stretch to about 20″ long as you roll. Using a very sharp knife (I sprayed my with cooking spray), slice the log into 15 slices. You’ll need to wipe the knife off between slices. Place slices in a greased 9×13 inch baking pan (or in two 8 or 9 inch round cake or pie pans). Cover with a towel and let rise (again) until almost doubled, about 45 mins. I’ll be honest here, my dough didn’t rise as much as I would have hoped. I can promised that it didn’t affect the taste in the least. Bake in a preheated 375° oven. The rolls should take about 20-30 mins, and will look brown around the edges and a light golden brown across the center. While rolls bake, you can prepare the cream cheese frosting. Add the cream cheese, butter, vanilla, and lemon juice to a small food processor. Blend until smooth and combined. Add the powdered sugar 1/2 cup at a time, blending in between, until well-mixed. Here’s where you get to decide how thin or thick your like your frosting! Frost warm rolls with the cream cheese frosting and serve immediately. 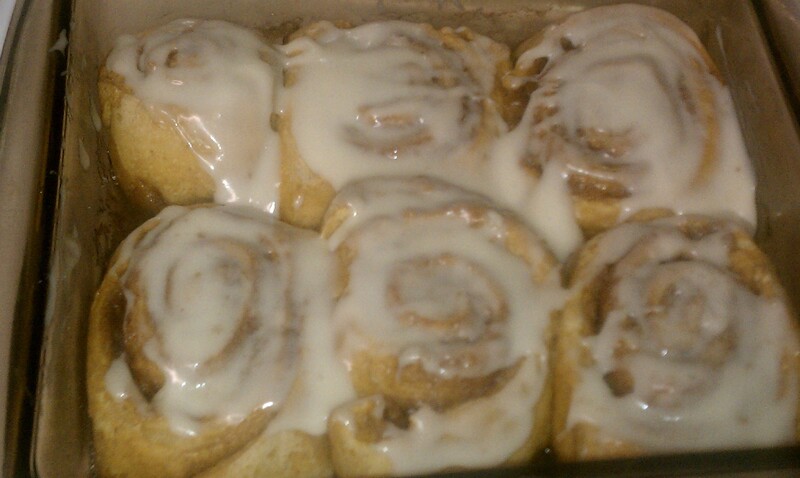 These were ooey gooey good! Stay tuned because I have a great way to use up the rest of your leftover rolls later this week.